Black Tap is a welcoming joint; with a cool and boisterous vibe with its unique decor. It’s barely been a hour since Black Tap opened and there’s a line of people curling around the corner. But what’s all this craze for? Black Tap offers an interesting menu with it’s creative craft burgers. Two of their most popular burgers are the award winning burger “The Greg Norman” burger, which is made with wagyu beef, house buttermilk-dill, blue cheese, and arugula. The second most popular burgers is “The Texan” burger, which is a prime burger with aged cheddar, crispy onion ring, bacon, sweet baby ray’s bbq, and mayo. The menu also includes craft burger salads, wings, a crispy chicken sandwich, and you’re able to include numbers of sides to your meal. All of these entrees cost approximately $20. I had the Pizza Burger, a prime burger, zesty tomato sauce, fresh mozzarella, and shaved parmesan. The burger came with side a of fries. The presentation of the burger was appealing to my eyes, but when I took a bite, I was disappointed. The meat was not cooked to my liking, which made me not want to eat the rest of the burger. I told them I wanted my burger medium well which according to them it was, yet it didn’t taste like it was. But the fries were cooked well, they were crispy and had just the right amount of salt. Besides the burgers, it’s their Instagram-ready milkshakes that is spilling over with toppings that are creating these insane lines. “Crazy Shakes” as Black Tap calls it, varies with your favorite desserts.These milkshakes come out to be $15. “The best part of Black Tap is their milkshakes. 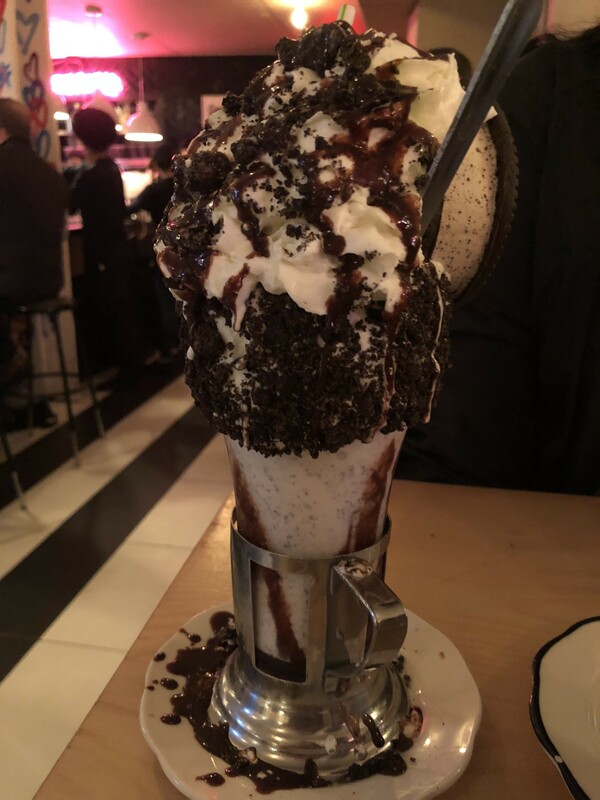 Whenever, I go to Black Tap I always get their Brooklyn Blackout chocolate shake,” Arashpreet Kaur said. I had one of Black Tap’s “Crazy Shakes” called Cookie ‘N Cream Supreme Oreo shake. I was really happy with my milkshake. The milkshake was really creamy, smooth, and I was getting the taste of oreos the whole time. The presentation of the milkshake was really nice and really caught my attention. The line was something I wasn’t planning to stand on. So I went during a less crowded time frame of the day. I went around 12 noon and I didnt need to wait on line, but when I left Black Tap there was a huge line next to the entrance of the restaurant. But what is like working at a place like Black Tap? “I really love working in the atmosphere Black Tap has! I love that Black Tap offers a fun, simple, and straightforward menu, plus I get to be a part a solid team of crew members,” said Dominick Pate, a server at Black Tap. Overall, I liked my experience at Black Tap. The staff was really nice and welcoming, and the cool vibe of the restaurant was something that made the place inviting. I would recommend this place for a milkshake. Hey! My name is Harjot, and I write for the food section here at the Edison Light. Writing about food,gives me the chance to experience different cultures on one plate. Also writing for the food section gives me the opportunity to go on adventures. Adventures are something I always look forward to because of memorable events you can always look back on. In my free time, I like to catch up with friends and family. Enter your name and email address to subscribe to this blog and receive notifications of new posts every week by email!